Dear Friends and Supporters of The Racehorse Sanctuary, thank you so much for your continued involvement, encouragement and donations. The horses have been very good this year and have one very special Christmas request of Santa Claus: lots more new friends for 2017, especially to help us settle in at Brewham Lodge and get to know our neighbours. On behalf of all the horses in the care of the Sanctuary, Wavertree Warrior has arranged an interactive Christmas e-card for you. To view and enjoy your card, please click here and follow the on-screen instructions – ENJOY! Announcing our National Spirit Hurdle Raceday at Fontwell Park Racecourse. Please make sure you have the date Sunday 26 February in your diaries. Continuing a well-established tradition, we are again holding our first major fundraising of the year at Fontwell Park on Sunday 26 February 2017. This is a special day for us, but it is also a special day for the racecourse, as the card includes the most prestigious race of Fontwell’s calendar: the Totesport National Spirit Hurdle. Your organising committee is in the process of finalising the details, but the format will follow the successful pattern of previous years: Champagne reception, three-course silver service lunch with wine included, compered charity auction and afternoon tea, in an exclusive room with panoramic views of the afternoon’s racing – all at a very reasonable price for a bumper package. With plenty of time to recover from Christmas, please put this important date in your diary and brief your friends about this opportunity to enjoy yourselves and help us to raise crucial funds for caring for our horses. We shall very much look forward to seeing you at Fontwell Park. Saturday 10 December saw the Thoroughbred Ball held at the RAC’s Woodcote Park in celebration of the charity’s 10th anniversary. 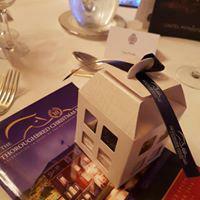 This year’s Thoroughbred Ball was held at the RAC’s Wooton Park in Epsom and was well supported in this our 10th anniversary year. Guests sat down to a sumptuous dinner in luxury surroundings, before bidding generously for some fabulous auction items, then dancing the night away to the music of The Overtures, the ultimate 60’s tribute band. 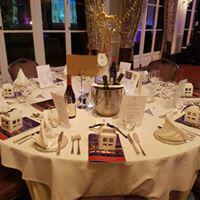 A good time was had by all, bringing in a very welcome £18,000. Our thanks go to the tireless organising committee for their hard work, to all those who donated auction items, to the energetic helpers on the evening, all of you who turned out to enjoy yourselves, and especially to Julia in her role of mission control. The move from Stilemans to Brewham Lodge has progressed smoothly this month, with Graham moving the horses in small batches. Brewham Lodge is now nearly full as Graham completes the transfer of his charges to North Somerset. The charity’s new home has sixteen stables, indoor and outdoor schools, a round pen, super hacking, two cottages and 40 acres of grazing. 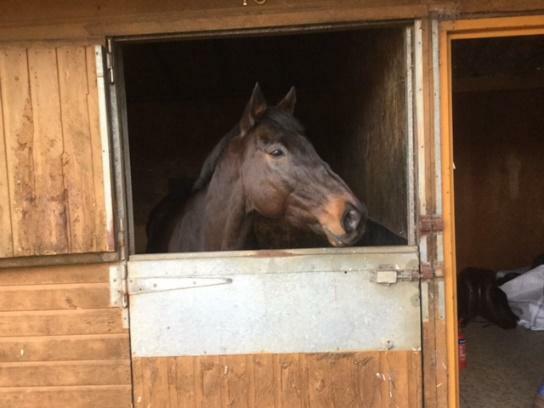 Our new Yard Manager Ruth is settling in well with her family, having moved them all to Brewham from West Sussex. 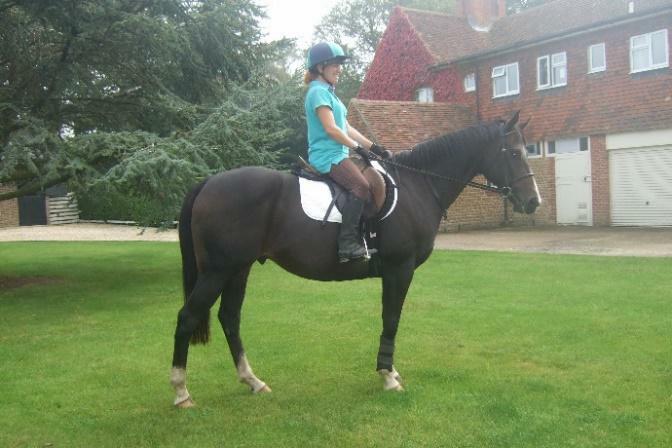 The picture here is of Ruth riding Radical, who has since been rehomed from Stilemans. Working alongside Ruth at Brewham is Jemma on the right in the picture, who is also settling in well, having moved from Surrey. Both Ruth and Jemma have worked with us for some time and are totally dedicated to ex-racehorse welfare. Edward has been recruited locally to complete the team for the time being. 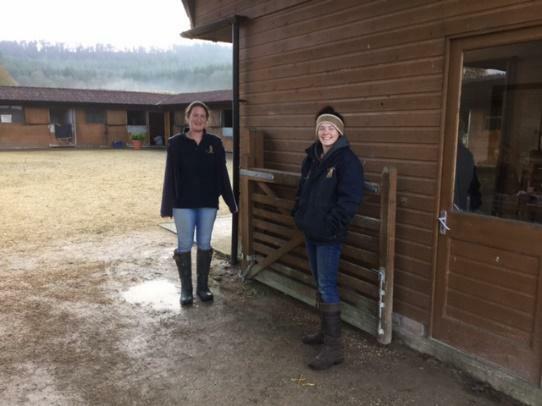 That is Emily in the woolly hat, who helped Graham bring Wavertree Warrior to Brewham Lodge, after Warrior had been reshod by the specialist farrier at the Liphook Equine Hospital. Making new friends in North Somerset & 3D printing. Our horses at Brewham will be receiving first line veterinary care from Tim Randle of The Stables Equine Practice in Wookey near Wells. Tim kindly invited Ruth and Jemma to the practice Christmas open evening. He has also provided some very helpful feedback on the ideas being developed by volunteer David with NAMRIP at the University of Southampton for 3D printing of patient specific equine treatment shoes – an innovation, which could potentially help older horses with foot problems. Do we have any readers with expertise in 3D printing? If so, David, would love to hear from you; please call him on 07770 308778.